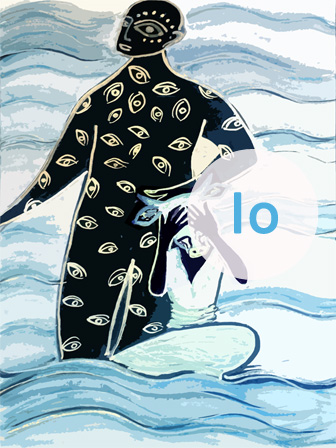 Io, in many ways, is the quintessential Greek Myth. In addition to highlighting the anthropomorphic nature of the Greek Pantheon, Io also serves as a creation story. Furthermore, the story of Io makes apparent the series of cause and effect relationships--set in motion by the Fates--that dictate the lives of mortals, gods, and demi-gods alike. To new readers, what is sometimes most striking about the almighty Zeus, Lord of the Heavens, or his wife, hera, is not their austere majesty, but their humanity. In countless stories, Zeus is the living portrait of the unfaithful husband, and Hera, the living portrait of the infinitely jealous wife. Despite their immortality, and impossible beauty, these gods are not governed by boundless wisdom, but by recognizably human emotions--love, lust, jealousy, and wrath. Even more striking, and somewhat disconcerting, is that these fickle and vengeful masters of the universe have all of humanity as their playthings. The story of Io, for example, is set in motion by Zeus’ lust for her. Io’s subsequent transformation into a cow, and years of suffering and estrangement from her friends and family, are merely the whims of a jealous woman. What this story makes clear, is that although these gods attempt to distance themselves from humanity, they have quite a lot in common. In the world of Greek mythology, the phrase “made in God’s image,” rings more true than in the judeo-christian tradition. This point aside, the story of Io is also emblematic of the Creation Myth. This story, in particular, explains the origins of two phenomenon observable in the natural world; the sea of Bosphorus and the feather of the peacock. “Bosphorus” in this case, translates to cow, and is named in honor of Io’s deep sea pilgrimage across this previously unnamed body of water. In addition, according to this story, peacock’s got their celebrated feathers from the severed head of the watchman, Argus. After Argus’ death, Hera, in grief, attaches his many eyed head to the tail of a peacock, thus assuring his symbolic immortality. Finally, the story of Io stresses the web of fate that both explains all things that already have been, and all things that will one day be. For example, upon meeting Io, Prometheus tell her how to regain her true form, and also reveals that she will be the mother to a line of kings and heroes, one of whom, Hercules, will free him from his mountain prison. As any reader of Greek myths knows, Prometheus’ words prove prophetic. This piece is perfect as part of an introduction to myths, folktales and fables, particularly those designed for a younger audience. In addition, this piece also works well as part of a lesson on creation stories, and can be used to help inspire students to write their own creation myths. When you think of gods, or goddesses, what do you normally think of? Do the Greek gods portrayed in this story match up to the images and descriptions in your head? Why, or why not? This link provides teachers with a detailed analysis of this story. It gives significant attention to Io’s chance meeting with Prometheus at the end, and explains the symbolic importance of this meeting.